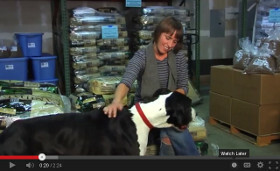 Here’s what you need to know before visiting The Pongo Fund Pet Food Bank. The Pongo Fund provides more than 2,000,000 super high-quality pet food meals each year and we look forward to helping you too. We require that you treat everyone at The Pongo Fund with courtesy and respect. The Pongo Fund is a NO SMOKING area and we have NO RESTROOMS available. We love animals but space is limited, so please do not bring your pets with you. 10:00am–Line begins and entry tickets provided. 1:00pm–Last entry ticket given out. If this is your first visit, please arrive by 10:30am to complete a Pet Profile Form. Please be patient as you will likely wait in line for some period of time, particularly on your first visit. After your first visit you may arrive anytime that you wish, as long as it is before 1:00pm. If your pets have already been spayed or neutered please bring documentation to confirm this. If you do not have such documentation, please contact the clinic or rescue group or shelter that performed the surgery and they will happily provide you with that documentation. As an alternative, any veterinarian can also provide you with a brief letter confirming this has been done. We will always provide you with the highest quality food, and as much food as our guidelines allow. We will not provide food for multiple pets belonging to multiple people living at the same address. You must be at least 18 years of age to directly access our services, but we do provide food to many different food pantries and other organizations that maintain their own age guidelines. Our mailing address is PO Box 9000, Portland, Oregon 97207. Our pet food bank address is 3632 SE 20th Avenue, Portland Oregon 97202. Telephone 503-939-7555. If you cannot get to our Pet Food Bank please contact these other pet food resources. The Pongo Fund Pet Food Bank is conveniently located at 3632 SE 20th, Portland, OR, 97202, near SE 20th & Powell Blvd, in the Central Eastside area. We are served by Tri-Met bus lines 9, 10, 17, and also the new Orange Max Line. Plan your ride with the TriMet Trip Planner. Disabled or on Medicaid, or facing other challenges? You might qualify for the TriMet Ride Program.